Children’s temper tantrums can range from mild whining to extreme displays of physical outbursts; unfortunately kids don’t tend to keep their tantrums to the confines and privacy of their own homes and can lead to some parents becoming very embarrassed when out in public. Do not worry however, as they are not a sign of behavioural problems and are considered to be a regular part of a childs development. Why do Kids Have Tantrums? 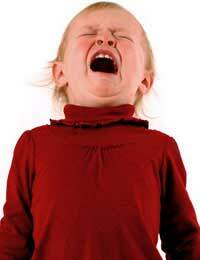 Children especially toddlers can have tantrums for a number of different reasons. They do not understand what patience is and can find having to wait in a queue a source of annoyance which can trigger a tantrum. They often do not understand why a parent says no or does not allow them to do something or wants them to do something they don’t want to such as go to bed. Communication barriers and an inability to express themselves is also a key issue where tantrums are concerned and parents must bear this in mind when managing an outburst.Experts are also now sure that their diet can cause anger to manifest and trigger an outburst especially when they have a lot of sugar of additives. What ever the reason, the way the adult or parent responds to the tantrum is fundamental in how they are managed and occur in the future. Tantrums can be very physical and often involve the child throwing themselves on the floor and hitting out with their hands and feet, throwing something, kicking out, holding their breath, screaming, shouting and spitting to being more mild and simply involving the child crying and sulking. Each child will interpret their anger and frustration in a different way to others and their temper and how it is controlled will be at a different level to other children, but the parent must be consistent in their management of the episode.The most common time for tantrums to appear is during the pre-school years, but are especially seen in toddlers. Trying to control your child’s tantrum is a skill should be a learned technique. It can be very tempting to lose control much like your child and respond to them using similar behaviour as they are displaying especially if we are tired and haven’t got much time but it is vital that parents learn how to manage the situation effectively with the aim of reducing the frequency and severity of future tantrums. Try and distract them with something else that captures their interest before the tantrum is allowed to escalate. Praise their good behaviour and ignore bad however if the tantrum continues there is sometimes little you can do except to ignore it altogether and let them know you are not pleased with their display of anger. The most important thing is to make sure that they and those around them are safe and are not likely to hurt themselves. Take them to a quiet and calmer area and allow them the chance to cool off. Stay within eyesight but try not to pay them too much attention as this is exactly what they are wanting. Tell them in a stern voice (but not shouting) that their behaviour is not acceptable and you will return to them when they are calm. In an ideal world toddlers wouldn’t have tantrums at all but this may not be realistic as sometimes they are part of their development but there may be ways of avoiding some of them. Make sure your child isn’t too hot, cold or hungry as this can worsen their temper quite significantly.Children can find it difficult finding their own feet and independence in an adult world and this can be a source of frustration so sometimes it can help if the parents find small ways of giving their child responsibility or choices. Maybe they can choose their clothes for the day (don’t give them too many choices though as this can be overwhelming) maybe they can feed the pets or help water plants as part of their jobs. Whatever way you find of giving them some responsibility, make sure you are consistent and don’t do the job for them before giving them the option. If you feel as though your child’s tantrums are getting the better of you, please speak to your health visitor who will be able to offer guidance, advice and help through this difficult time and teach you the techniques needed to hopefully find a way of managing to successfully control your child. Children’s tantrums can be very embarrassing and seem to occur at the most inappropriate times, but occasionally children will know that their parents will give in to their demands if they are in public because of this. Consistency is the key issue and making sure that bad behaviour is not rewarded is essential in successful management of an anger outburst. Is There a More Serious Reason for your Child's Anger?